It’s here – and just in time for party season! Our new collection of six sublime sapphire and diamond cocktail rings is now available. Be the first to try on and view the collection by booking an appointment with Neil Geddes on 01937 844 990. At N.J. Geddes Fine Jewellery we do things differently. Our starting point is to find the perfect stone, seeking out the best quality jewels from our network of international suppliers so that they have the highest colour grades and better certification. Once we have found an extraordinary jewel, we design the ring around its unique personality. And that is what we’ve done with our new collection. Using feedback from our clients and working with our award-winning master jewellers, we have hand-crafted six elegant cocktail rings that ooze glamour, fun and sophistication. Each ring has a unique design. A 1.25 carat vivid blue sapphire surrounded by approx. 0.94 carat of diamonds with a spiralling, stylish twist design. You’ll notice that our sapphires aren’t just blue they are vivid blue or what we term in the jewellery world as ‘cornflower blue’. A 1.32 carat vivid blue sapphire surrounded by approx. 0.33 carat of diamonds in a delicate oval setting continuing down the shoulders. A real timeless classic. An oval 1.21 carat vivid blue sapphire surrounded by approx. 0.33 carat of round diamonds and 0.10 carat of marquise diamonds. Set in a unique design with floral notes on the shoulders. An oval 2.73 carat yellow sapphire that is lush, vivid and clear, set in a wrapping swirl design surrounded by approx. 0.29 carat of diamonds. 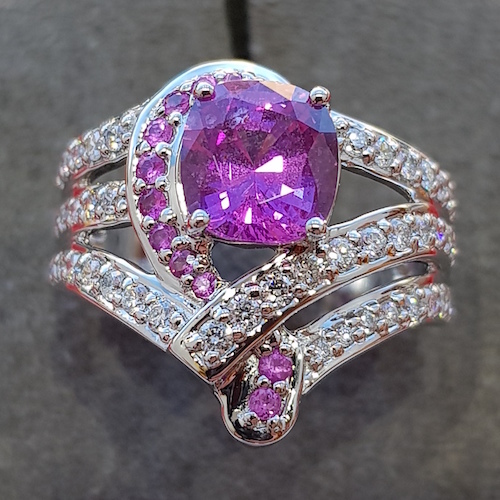 A 1.92 carat cushion vivid natural pink sapphire that is certified as ‘no heat’ meaning it is much rarer and more sought after. This alluring stone is set as a real cocktail ring going down the finger, surrounded by approx. 0.6 carat of diamonds, crossing over. A unique piece for any party occasion. The showstopper. 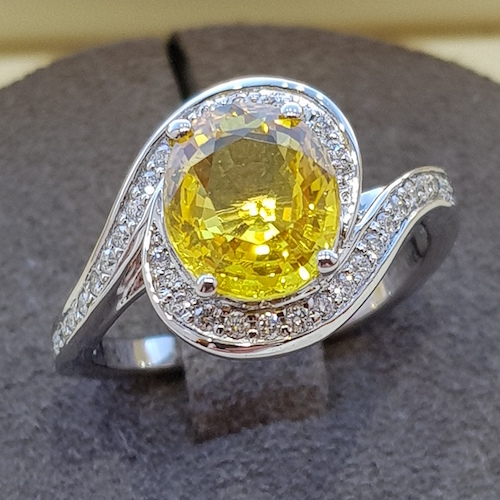 This unique long finger ‘Toi et Moi’ style ring contains two cushion cut fancy intense yellow diamonds totalling approx 0.28 carats. 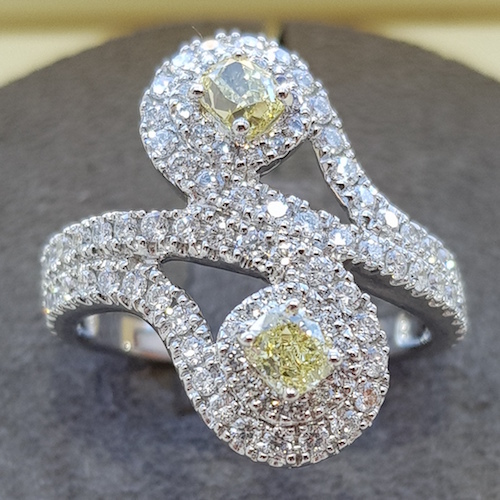 The ring has an elegant swirl design which houses the yellow diamonds centrally, they are surrounded by approx. 0.92 carats of colourless diamonds. The yellow diamonds were selected for their strong yellow colouring and fire. All jewels come with an international certification and are set in platinum rings. Our collection features a variety of beautiful stones in different colours and designs, so that you can choose the ring that best matches your style, personality or perhaps a very special outfit. Although it has to be said, any one of our striking collection is sure to make you the centre of attention this party season. So, the question is, which one will you choose? If you would like to arrange an appointment, either at the boutique in Boston Spa or at a location of your choice across the UK, please get in touch with Neil Geddes. If you would like to be informed of new jewellery collections and receive fine jewellery news and inspiration, sign up to our mailing list.